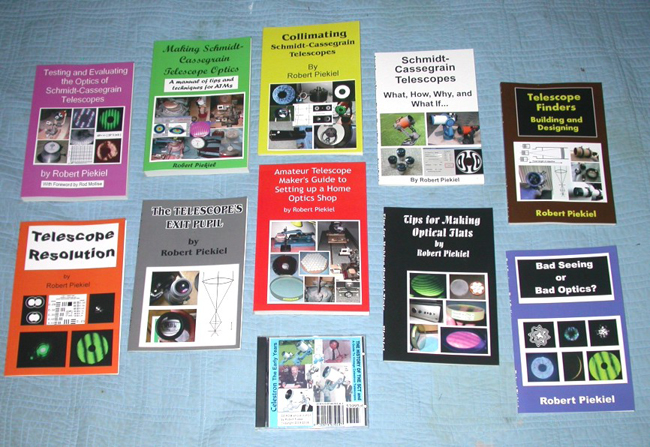 I am pleased to announce that Bob Piekiel’s collection of self-published SCT books, including his new “Telescope Finders, Building And Designing” and his epic “Celestron: The Early Years” are now listed on the cnyo.org website at www.cnyo.org/books-by-robert-piekiel/. 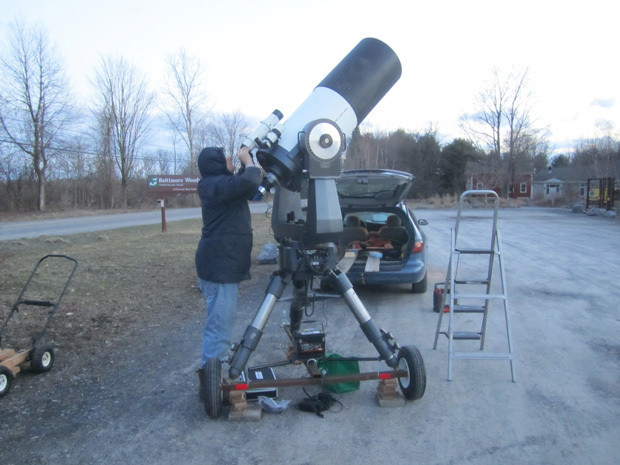 Bob has a long history in the CNY amateur astronomy community, both as a lecturer for local astronomy clubs and as the host and organizer for public viewing sessions at Baltimore Woods Nature Center and Green Lakes State Park. 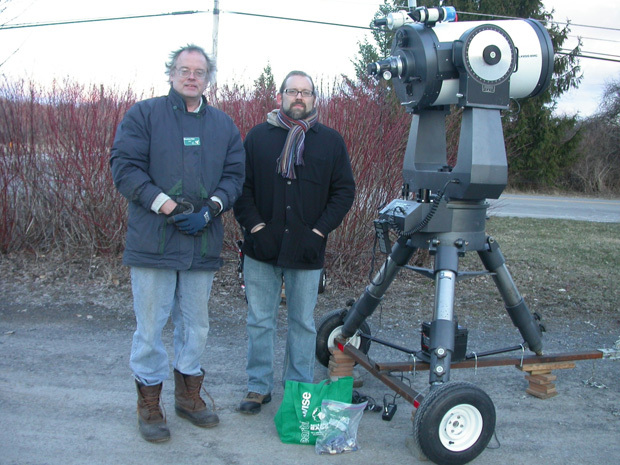 We are even more pleased to have him and his scopes at hosted CNYO events. Bob can be reached directly with questions or purchase inquiries about his many books at piekielrl _at_ netzero.com. The approximate location (at center) of the session. 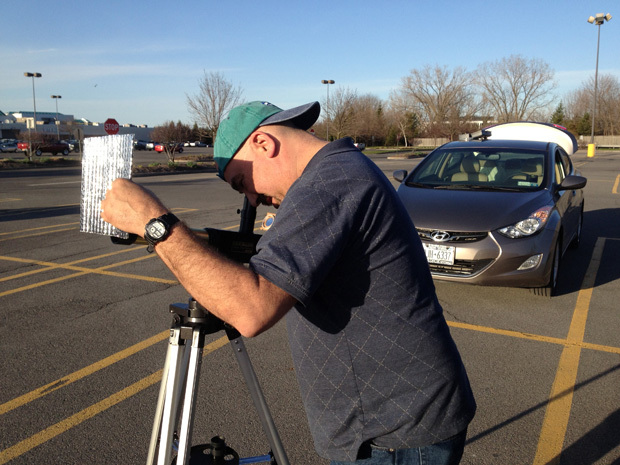 With Larry’s 8″ Meade Schmidt–Cassegrain Telescope (SCT) (and homemade Baader solar filter) and my Coronado PST in tow, we hosted a 90 minute session before the CNY Skeptics meet-up with about one dozen attendees (and a curious ShoppingTown Mall security guard) and our two most prominent celestial neighbors – the Sun and Moon. 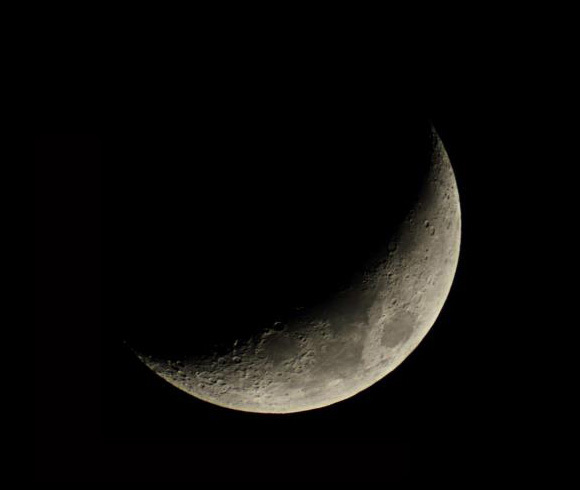 The Moon was a 7-day-old waxing crescent on the 17th and high in the sky at 6:00 p.m. 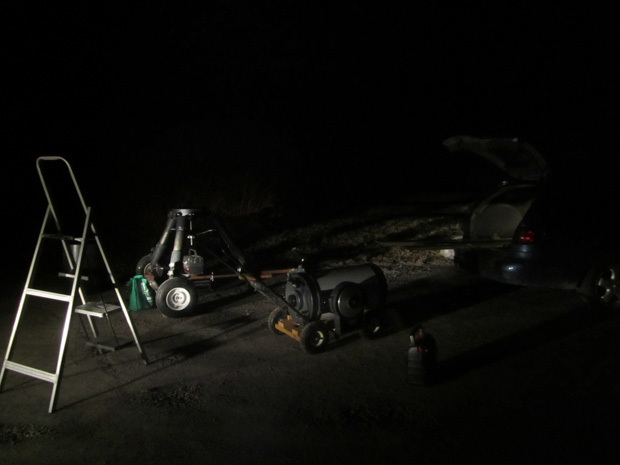 While Larry had his Baader filter at the ready, he ended up spending most of his observing time (due to crowd interest) examining all of the blue-on-grey surface detail that this late afternoon session afforded. A later evening image of the waxing crescent (from two days prior) is shown below from local astrophotographer John Giroux. The waxing crescent Moon on 15 April 2013. Photo by John Giroux. The Coronado PST filters nearly all of the incoming light from the Sun, making it comfortably observable and making anything else seen through the Coronado (short of a blindingly bright hydrogen lamp) pitch black. So, by necessity, my part of the session was dedicated solely to the Sun as it set in the tree-lined western DeWitt sky. The Coronado brings out sunspot, surface, and prominence detail using a 1.0 angstrom hydrogen-alpha filter (which is to say, that’s the only wavelength of light that gets through). The views are composed of ever-so-slightly different shades of red, but the detail is obvious with proper focus, magnification, and filter adjustment. 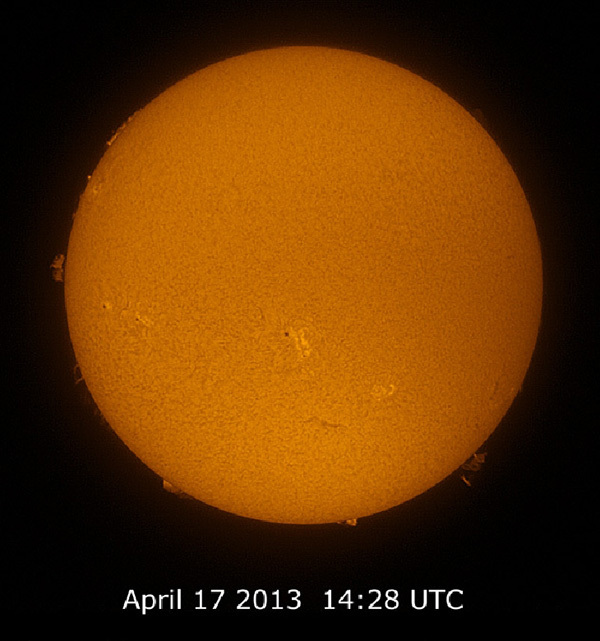 The Sun was busy with prominences and highlighted on the surface by Sunspot 1745, shown at lower center in the image below from Ted Adachi’s submission to spaceweather.com that day. The Sun, by Ted Adachi. 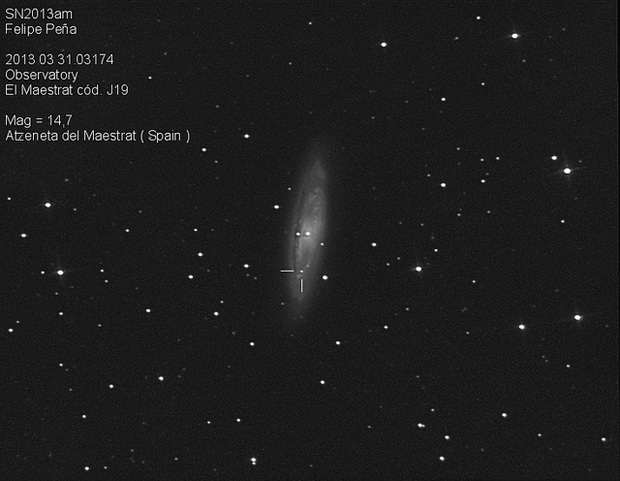 Over the course of 90 minutes of observing, I learned two valuable lessons for the Coronado. 1. Reducing some of the incoming light does a bit to help bring out some solar detail. Even covering the objective 50% produced detailed views that helped enhance some of the surface detail (as Larry demonstrates below). 2. The perfect eyepiece for filling the Coronado with a view of the Sun lies somewhere between 7 and 10 mm (a point that will be addressed in an upcoming discussion about NEAF 2013). Larry demonstrates the light-block maneuver with a piece of reflective aluminum/bubble wrap. 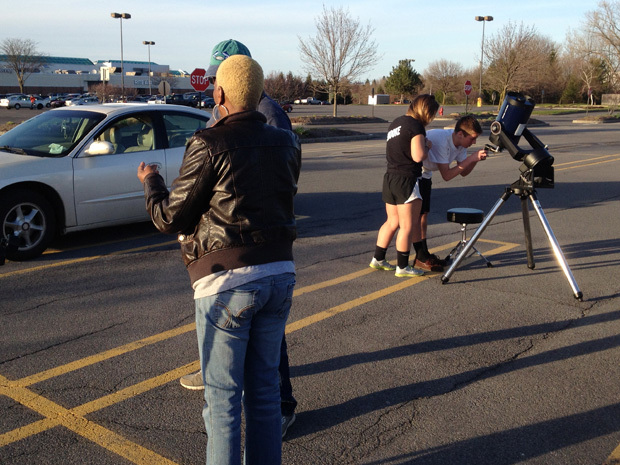 With short notice, small scopes, and a clear sky, the daytime becomes just as interesting and enjoyable a time for an introductory sidewalk astronomy session as the night does. 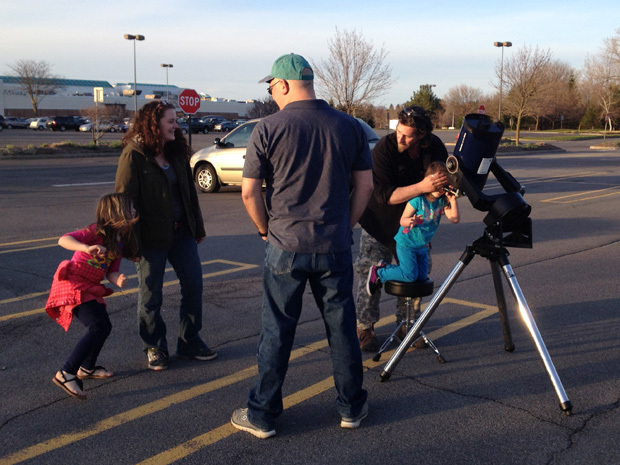 Young kids and adults alike get to take in a brand new view of our nearest neighbors while being able to see the scopes that make these views possible. And it is much easier to find missing eyepiece caps!